Based on a story so true you wouldn't need a confession. I poured the whole bowl of beans in the toilet bowl, and flushed. It didn't matter that I had just bought them, or that I had a habit of hardly throwing food away, not when people are dying for hunger. This time though, the cook had gone quite far on the often trodden path of horrific tasting food. The smell too was that of boiling beans, a smell which bears a similarity to that of raw fish when it comes to working up your appetite of the finished meal. The aroma of my colleague's food wafted across the desk. Despite the growing hunger pangs, my ego would not allow me to borrow even the tiniest morsel. After all, haven't I been the one who has reinforced the habit of not offering anyone my almost-daily packed breakfast, or the occasional packed lunch. My argument has been that lunch, and breakfast, occur on a daily basis. anyone can therefore easily and accurate predict the occurrence of lunch and breakfast and they should therefore plan and prepare for the same. People should not get shocked when lunch approaches and they have no idea where to get food. You do see, our office is on the edge of Karura Forest - if you need lunch, you need to spend at least KSh. 20 to go find lunch and the same to return to the office via a matatu. The spending is not the problem. After all, we are a generation fixated on consumption, we buy lots of services and goods we hardly need, and often on money we don't have. The problem is the effort needed to acquire a meal, which sees you opting to forego the meal. It would take lots of inspiration from a Barrack Obama speech before you overcame the laziness needed to go find a meal. Hunger wasn't the only thing I was feeling on the fateful Friday. I was also feeling cold, probably the first time since October last year. Being a day of many firsts, I had also accidentally left my sweater in the house, after emptying and repacking my bag, leaving my sweater out on the untidy couch. For the last three months that it has been too hot to wear my sweater, I have been faithfully carrying it in my bag. But not that fateful Friday. On my way home, my brain went over the crucial decision on what to have for supper. I was feeling too lazy to cook. I doubt Obama would have inspired me here. Would it be the fries from the retired lady down the road - the ones that were specially dried, the way I liked them? To get the chips, you had to knock on the counter, and many a time wait for what seemed a hungry eternity before you had the tug of slippers. The bespectacled lady would then appear, with her wavy black weave that hid the true greying age of her hair, her oversize jumper and pyjama pants. But maybe I should settle for the the saucy "beef fry" from the neighbouring estate butchery. The beef was a thick gravy of meat stewed in tomatoes, well salted and simmered. It was aslo well priced at KSh. 160 with a manly serving of ugali. Not the ugali they serve you in upmarket establishments - a soft lump shaped from a malnourished bowl, and with a price tag that scares away your hunger . Maybe I should buy those sweet chapatis from the neighbourhood food joint. They are the kind chapatis that command your undying loyalty to the food joint. They are so well made that you wonder why the Kenya Bureau of Standard is yet to award them with the Diamond Mark of Quality. The butchery was too far, being in the next estate. It was already eight p.m., plus I hard work to do. The bar the butchery serves you from is always too tempting for a sugar-free WhiteCap , or two. Again, the maize flour they make the ugali isn't Jogoo. Too much education has made me scared that they are testing genetically modified maize on us. You can't blame me for my fears. The newspapers have reported genetically modified maize arriving in the shiploads at the Mombasa port, to alleviate our regular bouts of famine. They never report which famished people the maize ends up in. They put a little bit insecticide in the maize seeds. It blows out the stomachs of any pesky pests. Studies have shown it's safe in the lab. They haven't carried out studies on human beings. Let me try the chapatis. But what shall I have them with. Perhaps the beans or ndengu from the other remaining food joint. Food joints are good business, but managing them is a task, especially with dishonest employees. Honest employees might have missed out when culinary talents were being dished out. The third joint no longer served hot meals for bachelors. The owner was now selling hot handbags and high-heeled shoes for spinsters. I wonder if they sell like hot cakes. I got the chapatis. Five for good measure. Some would be lucky enough to make it through the night, but not past breakfast. They came in their creamy brown colour, and hot in the black polythene. I crossed over to the bean shop, through a path that was almost disappearing in between the over grown grass. The grass went a little above my knees, and was wet with the day's rain. I wondered if snakes might lurk in the grass, but my hunger provided more than enough courage for me to soldier on with cautious, long hops. As fate would have it, there was only one cold cup of fried beans left, not enough for the hot one and a half cups I needed. One was better than none. But the beans would need warming, which wasn't usually required on other days as you would find them warm and ready. In the house, I decided to warm the beans. I also added a little water, to add some soup and lessen the burden on my stomach. Not that the stomach normally complained. It had made it through a number of vibandas, and the weevil strewn githeri in high school. The githeri also had enough rocks to see our physical geography classes make it to post-lunch conversation. As the beans got warmer, first a yellow layer of some oil floated above the water, followed by the familiar smell of boiling beans. I figured out it was probably a small hitch. It wasn't. A single spoonful brought the horrible taste of un-fried beans. It was unpalatable. That's when I poured them down the toilet bowl. I then got the frozen beans. I had been feeling too lazy to fry and simmer the pressure cooked beans I kept in the freezer. 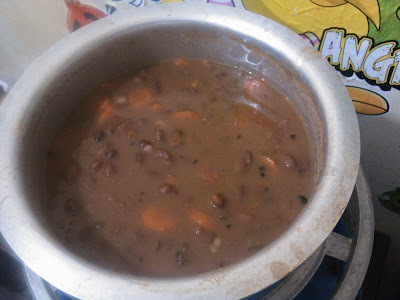 The crappy beans gave me a zeal to prove that bean stew did not have to be half a trip to hell. In no time, the onions were cut. In quick succession, the green bell pepper, the tomato and the carrot went under the knife, and were soon simmering in a thick paste. The beans joined them shortly, and it wasn't long before I had red simmering bean stock . The little effort taken made me wonder why I had been so lazy in the beginning. Two and a half chapatis later, I couldn't help feeling that maybe I had had one too many chapatis. Not that my friend hadn't warned me that three was too many for a man, but who was I to take free advice? The remaining half confirmed that I had accidentally over eaten, yet again. It must have been the sweet beans. I couldn't stop myself from having more of the beans and chapatis, till I had overeaten. And to remember I could have settled for less.